Realistic wood panels design wallpaper. 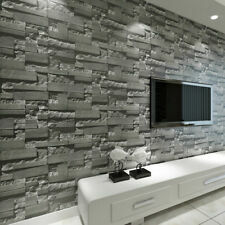 Distinctive Panel Wallpaper by Fine Decor. Paste the paper wallpaper. High quality wallpaper. Self-adhesive wallpaper, you do not need to buy a separate glue, tear the back of the paper can be used directly paste. Paste the wall and backside of wallpaper. Material:Vinyl surface paper based. Require Pattern repeat: Yes. Color tones can vary due to lighting in the room, pictures on wall for reference only. Product Type: Roll. Design repeat: 20.8" x 20.8(53cm x 53cm),Drop match. Color tones can vary due to lighting in the room, pictures on wall for reference only. Application Range : Living room, Bedroom, Sofa and TV background, Dinning room,Photo studio,Staircase and Study Room, Children Room,Hallways,etc. Features: Red brick effects are made from textured paper for a realistic effect It is washable and strippable Suitable for feature walls and entire rooms. The color is not easy to fade. Wide range of applications,it can use in living room,in bed room, in study, in kids' room and as a TV background. Perfect for both renters and homeowners The ultimate DIY solution for giving walls or decor a fresh new look at a fraction of the cost. Descriptions: . Pattern: brick stone effect. Design repeat: 20.8" x 20.8(53cm x 53cm),Drop match. Application Range : Living room, Bedroom, Sofa and TV background, Dinning room,Photo studio,Staircase and Study Room, Children Room,Hallways,etc. 3D Leather Effect Cushioned Headboard Wallpaper Roll Chesterfield Vinyl Dark Grey for Living Room Bedroom TV Background Decor. Color tones can vary due to lighting in the room, pictures on wall for reference only. TILE WALLPAPER is a thick 3D washable waterproof tiled effect wallpaper, that can be applied to flat walls or over existing tiles. This extremely durable wallpaper can be applied in wet areas, just remember to seal all the edges using silicone sealant. This wallpaper is meant to run across the wall and not down, so perfect as a kitchen splash-back where you'll have a continuous design and no annoying joins for 4m. - 3D effect - Washable - Suitable for wet areas - Seal edges and joins - Durable - Realistic printing designs - Design runs down the roll not across - Ideal splash-back solution over tiles - Glue required over tiles which we also supply Application product information is below. - Preparation of under-surface and . 1 X Minimalist Forest Birch Tree Black White Woods Wallpaper (without glue). Techniques: Deep Embossed Pattern. Material: Non-woven Base, PVC Surface. Product Details. Paste the paper wallpaper. 1 Wallpaper Roll (53cmx10M). Colour available: Dark Grey. 53cm half drop pattern repeat. Ideal for feature walls and entire rooms. Easy to apply.